Here Kitty Kitty....I see you Bubbly Kitty ...you may be white but you will change into purple and pink..This bath bomb has purple and pink embeds in them. 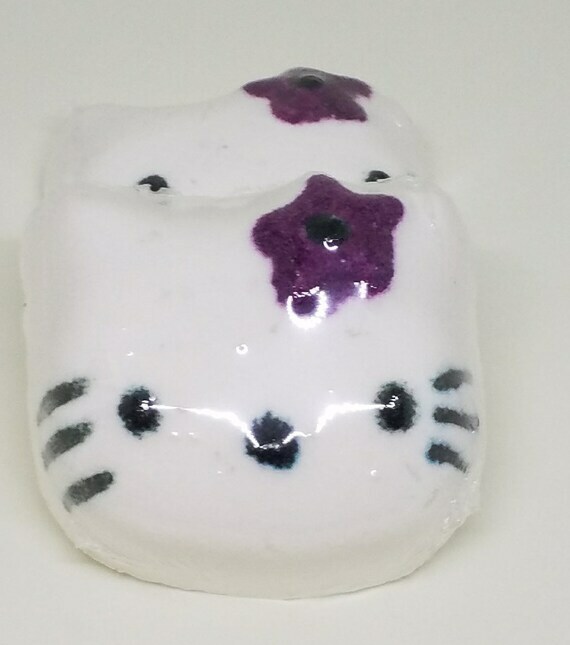 The Bubbly Kitty is scented in Waterlily and Bluebell. These aromas of wild bluebells and violet flowers will leave you feeling surrounded in a field at the break of a morning dew. Each bath bath weighs 4.4 ounces. All my bath bombs are personally handmade my me not a machine or bath bomb press. Being made by hand, weights may vary by .2-.5 ounces. I always use the lower weight so most commonly the bath bombs weight more than what is listed but never less. All colorants used are bath certified FDA lakes or dyes so, they won't stay you or your tub. They will, however, change the bath water but how dark or deep depends on what affect I was going for. I use premium grade epsom salts made epecially for bath soaks. My cocoa butter is unrefined to retain all the benefits of its goodness. **Baking Soda: It is a good exfoliating agent that helps remove dead cells. In addition, it balances pH level of the skin, which is very important to maintain even and clear skin. **Avocado Oil: An excellent source of omega-3 fatty acids and vitamins A, D and E, avocados can provide skin with deep moisture. The oil of an avocado penetrates the skin but is also thick enough to serve as a protective barrier. **Cocoa butter is high in fatty acids, which is why it’s often touted for its ability to hydrate and nourish the skin and improve elasticity. The fat in cocoa butter forms a protective barrier over skin to hold in moisture. One common use of cocoa butter is to smooth scars, wrinkles, and other marks on the skin. Many women believe cocoa butter creams and lotions can be used during and after pregnancy to prevent and minimize the appearance of stretch marks. Cocoa butter has also been promoted to heal rashes from conditions like ezcema and dermatitis. **Epsom Salts: has beneficial properties that can soothe the body, mind, and soul. Some of the countless health benefits include relaxing the nervous system, curing skin problems, soothing back pain and aching limbs, easing muscle strain, healing cuts, treating colds and congestion, and drawing toxins from the body.